Lemon Grass (Cymbopogon citratus) has light gray-green wispy leaves that grow to 24 - 36" and yield a lemony scent. Its flavor is excellent for teas, salads, fish, poultry and Asian cuisine. It is typically found in Thai recipes. This fun package of Lemon Grass herb tea was another souvenir gift from the recent trip our cousin took to Southeast Asia. Made in Cambodia, this skillfully crafted reed basket contains powdered lemon grass. Lemon Grass is the distinctive lemony fragrance found in Southeast Asian cuisine. The recipe included with the basket provides instructions to prepare Lemon Grass Tea (frappe). To prepare this specialty drink, after making a simple sugar syrup, you add fresh lime juice and lemon grass and then infuse black tea for 5 minutes. Strain, and serve over ice. While on vacation this past summer, I prepared the Lemon Grass Tea as instructed, and it was described as an 'exotic flavor' by my cousin's husband. Our cousin recently returned from a unique trip to Viet Nam where she purchased this box of herb tea as a souvenir. Artichoke tea, 100% artichoke in tea bags. The package, in both Vietnamese and English, explains the healthful benefits of drinking artichoke tea. A sister recently travelled to Germany and brought home some tea packets as a souvenir. These colorful packets are designed to be addressed and mailed to a friend as a thoughtful gift. Thanks to Google Translate, the green tea package reads "Anything really worthwhile takes time, just like a good cup of tea." and the yellow package reads, "For You. A bath refreshes the body; a cup of tea, the spirit." Reading the label on the reverse reveals that these packets contain flavored Rooibos, one is vanilla flavored, and the other contains elderberries, orange peel and safflower. Rooibos is harvested from the Red Bush plant native to South Africa. This herb tea is naturally enriched with nutrients such as iron, potassium, calcium, and fluoride. Once brewed, it produces a fruity cup with sweet notes that is reddish orange in color. Naturally caffeine free, it's a unique alternative to decreasing caffeine intake. Last week we hosted a Medieval Dinner and Program in Sweet Remembrances. The tables were set with trenchers, hollowed out slices of bread that served as plates for several courses of the feast. In earlier days, it was acceptable to use the tablecloth to wipe your fingers. However, as cultures progressed, napkins were used, typically draped over the left shoulder. As fashions developed, the napkin would be wrapped around your neck and the expression 'to make ends meet' developed. Silverware was limited. We provided a knife, although attendees at a Medieval feast would have provided their own dagger to spear the meat that was served. Forks were not considered appropriate to use and spoons would have been made of wood and later tin or silver. There would be a communal plate to serve the various courses. Our feast began with Dilled Veal Balls and a bowl of Cabbage Chowder. Saffron was a popular seasoning because of the flavor and gorgeous color it would impart on the food. The second course featured Golden Leeks and Onions and a plate of Puree of Peas. Mushy Peas can still be found in pubs throughout England. The trenchers would be gathered at the end of the banquet and given to the hoards of hungry that were gathered outside the castle gates. The next course included Chicken with rice and almonds and sauteed mushrooms and leeks. Dessert featured Pumpkin Bread with Lemon Curd, circletes (a type of cookie with currants) and mulled Cider. In addition, we were happy to be able to harvest fresh figs from our backyard tree. For additional information about figs, visit this earlier post written by Susanna. If medieval etiquette interests you, this previous post includes a bit of etiquette that we typically share with our guests when attending our Medieval feast. The last leg of a recent Rosemary House traveling herb seminar found us in Reading, PA where we had the opportunity to visit Abigail's Victorian Tea Room established in a beautiful 1883 Victorian Manor house. Rich fabrics, delicate laces, assorted china patterns, crystal chandeliers, stained glass windows all added to the wonderful atmosphere of Abigail's tea room. The Victorian Royal High Tea was featured this evening which included an assortment of steaming hot pots of tea (Peach Apricot, Orange Spice, or Berry). Berry scones and slices of orange bread were placed on the table as we arrived. Our next course featured a choice of chicken noodle soup or broccoli cheese soup accompanied with a mixed green salad and assorted dressings. A beautiful individual tiered tray was presented to each guest and held the tea sandwiches (chicken salad, tuna salad, cucumber, and apricot cream cheese on raisin) on the bottom tier and delicious desserts (brownie, raspberry tartlet, and berry cake) on the top tier. Our evening tea at Abigail's Victorian Tea Room provided a delicious and fitting end to a memorable day of touring gardens in New York City. 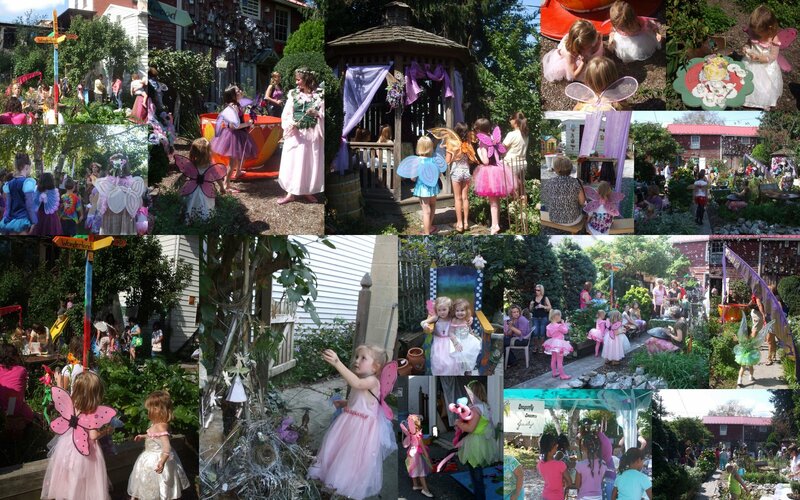 Calling all Pixies, Elves, Wizards & Fairies! One week ago we celebrated our annual Fairy Festival in the gardens of The Rosemary House and Sweet Remembrances. What fun we had! The rains during the entire week preceding the festival could not dampen the spirits of the sprites and pixies and fairies that danced around the gardens this weekend. Blue skies and happy faces prevailed. 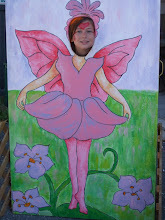 The Fairy Festival for 2012 will be held on Sat. Sept. 8th and Sun. Sept 9th. You will find information about our festival here. This precious little Pixie A-B-C book is the newest addition to our library. This Read-With-Me Big Time Wonder Book was printed in the UK for the publisher Peter Haddock Ltd., Bridlington. Don't you just love the colorful pixies, fairies, and plant life that adorn the inside cover? A few of our favorites, A is for Antics of Pixies at play...E is for Elves who chase butterflies... F is for Fairy who got a surprise! and, Z is for zest when they tackle their tea! Too cute! And today we introduce Miss September for Tea cup Thursday. In addition to August, September is the only other teacup I have in the Flower of the Month Series Produced by Royal Albert, it is fine bone china, made in England. September features the Michaelmas Daisy. We are happy to join Miss Spenser and others for Tea Cup Thursday. Happily, Miss Spenser's Special Teas tea room, located in Iowa, was recently featured in the newest edition of TeaTime Magazine. Did you happen to see the article? Some day we hope to meet Donna and her delightful family. A visit to her tea room is on our bucket list!